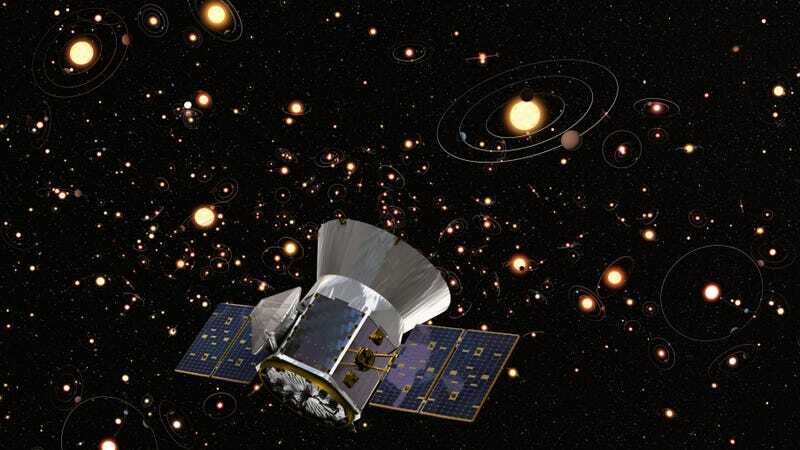 Artist’s concept of TESS hunting for exoplanets. Astronomers have created a catalog of 1,822 nearby stars around which the Transiting Exoplanet Survey Satellite (TESS) mission might spot planets receiving Earth-like levels of starlight. This is a crucial step in humanity’s search for an Earth-like, potentially habitable exoplanet. Whether life exists elsewhere and what it’s like, and whether there are other habitable planets more generally, is a question of enduring importance to humanity. It’s going to take, well, a long time to answer that question. But an important first step is figuring out where to look. That’s what this new paper does. “We have identified the stars where TESS can search for Earth-like planets,” Lisa Kaltenegger, associate professor in astronomy and Director of the Carl Sagan Institute at Cornell University, told Gizmodo. For these 1,822 stars, TESS is sensitive enough to detect planets as small as twice the Earth’s radius receiving radiation levels similar to what hits Earth. Of those stars, TESS could detect planets as small as 1.6 Earth radii for 1,690 of them, and one Earth radius for 408, according to the paper published in The Astrophysical Journal. And for 227 of those stars, TESS can search for planets in the fullest extent of their habitable zone—what humans think of as the Goldilocks zone for life, where liquid water can exist stably on a rocky planet’s surface. NASA’s TESS launched less than a year ago with a bold mission: to survey the nearby galactic neighborhood for stars with planets of their own. It’s already found its first exoplanet. TESS hunts for starlight that is periodically dimmed, suggesting an orbiting planet. An important subset of those planets are the Earth-like exoplanets in habitable zones. Kaltenegger and her teammates combined data from TESS with data from the Gaia satellite, an enormous catalog of nearby stars, to produce the latest list. They calculated these stars’ habitable zones based on the amount of stellar radiation candidate planets would receive at increasing distances from their host stars. Astronomers should certainly still look, of course. Ultimately, it will be up to follow-up missions like the James Webb Space Telescope and future missions like HabEx or LUVOIR to confirm whether these planets can actually host life. But if you’re hunting for Earth-like exoplanets, understanding what your telescope can actually do and cataloguing the stars that might host these planets is a crucial step. Correction: The article previously included a statement that TESS would only observe single planetary transits for some of the stars in this catalogue. In fact, the stars were specifically chosen because TESS would detect two transits during the prime mission observation time. The author regrets the error. When Will We Finally Find a Truly Earth-Like Exoplanet?